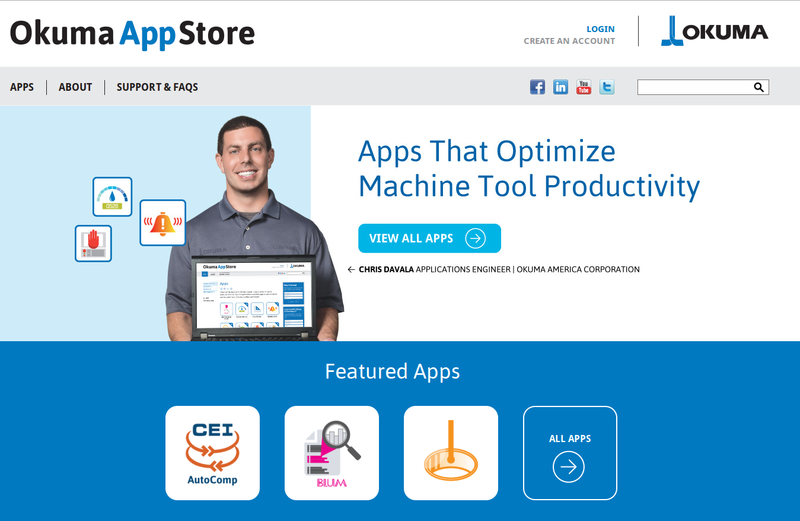 Okuma has recently launched an App Store. The site is not just for Okuma-developed apps: products by several THINC partners are featured on the store. Registration is required to download, but to see the range of possible THINC solutions, you can browse the apps at MyOkuma.com. My last post looked back on some of my unfinished projects. At the time of its writing, I was in a retrospective mood, and not just because it was the end of the year. After five years with the same company, I left my position at the end of the year. Three weeks into the new year, it’s too early to say how things will work out, but I know it was the right move. Still, I look back to see a lot of unfinished business: proofs-of-concept, prototypes for products that never materialized, pet projects perpetually on the back-burner, and so forth. Sadly, I won’t get to see them finished. I enjoyed working both in the THINC realm and in the growing MTConnect realm. Most of my posts in this blog were about one or the other. Since my new job is in a different field, unfortunately it seems unlikely that I’ll be able to continue working with either. As for this blog, time will tell what direction it moves from here. Awhile back, I wrote a Frequently Unasked Questions post, in which I answered questions based on popular search results for this blog. From time to time, I need an easy way to check the installed THINC API version on an Okuma P200 control. The problem is that the assembly version numbers don’t always reflect Okuma’s “official” release version number for the installation package. In fact, the Command API and Data API assemblies from the same release usually have different version numbers. Credit goes to Casey at Okuma for letting me know a simple way of checking the THINC API version as it’s listed on the installation package. The information is stored in the Windows registry, in the uninstall information, so just search HKLM\SOFTWARE\Microsoft\Windows\CurrentVersion\Uninstall for the THINC-API entry. Since the time I created this blog (a little less than a year ago), I’ve checked the site statistics quite a few times. Of particular interest are the search keywords that lead new visitors here: knowing the terms that people search for when they visit this blog helps me understand what type of information visitors expect. Predictably, many of the terms have to do with machine tools: “MTConnect”, “Okuma”, and “THINC” turn up quite often in the search terms. Others are a little more surprising. I think of each search term as a question that was never asked. So in this post, I thought I’d take some time and answer a few visitors’ unasked questions. Over the past month or so, I’ve been working on a project to provide remote access to Okuma’s THINC API. Since I’ve been working on this in my spare time, progress has been slow. Still, I started this series more than a month ago, and rather than meandering through numerous future entries, I’m going to try to bring some closure in part III. Welcome to part 2.5 in this series. Unfortunately, my development PC crashed over Thanksgiving weekend and derailed my plans for finishing part III last week. Instead, here’s a handwavy overview of where I’m heading. Last time, I outlined a plan for creating a remote access layer for THINC API. As I mentioned, the release of Okuma’s Remote API makes such a layer unnecessary. This is strictly for educational purposes. For developing custom solutions that run on the control itself, THINC API provides a powerful set of tools. We can read (and often write) a wide range of data: machine status, common variables, tool offsets, and so forth. If we want access to that same range of data outside of the control, though, our options are a little more limited. For quite awhile, most solutions for remote THINC access were homegrown, and provided access only to the subset of THINC functionality needed for a specific project. The Okuma THINC controls are advanced CNCs that are based on the Windows platform. This makes it easy to provide solutions using off-the-shelf Windows software. Additionally, Okuma provides a THINC API to enable .NET developers to create new applications that interface with the CNC. For this example, I’ll develop a simple application that addresses a common problem: changing the CNC panel mode. This is not a new idea: I’ve seen at least three different implementations, and it makes a simple introduction to THINC development.